Electric bikes change the way you experience bicycling and transportation. They are pedal optional so you can pedal for exercise, ride with motor power only, or just use the motor on hills or as needed. E-bikes put the pleasure back into getting from here to there. You can ride comfortably, and climb easily, so hills and wind are no longer an issue. If you are commuting to work you arrive without the sweat that a conventional bike may cause. An estimated 80% of an average persons travel is with the driver only and within 10 miles of home. Maybe it is time to give the environment a break and consider an electric bike. Electric bikes have been used, extensively, throughout Europe and Asia where high prices for gasoline are common but have been slow to catch on in the USA. Americans have an on-going love affair with our cars but this is beginning to sour since now gasoline prices of $4.00 plus aren't uncommon. The sale of e-bicycles has increased over 60% in the last year and now stands at over 300 million worldwide. Operating expense is about 2% of even a hybrid car when you consider not only gas but deprecation, maintenance, insurance, and parking. 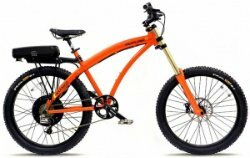 If a more traditional electric bicycle doesn't appeal to you there are even electric tricycles, electric folding bikes, or electric recumbents available that may be more to your liking. Some boomers and seniors feel that a conventional bike may be too much of a challenge for them but an electric bike (that is pedal optional) could be perfect for them. A very cost effective means of transportation. The battery needs to be topped off regularly but this is, relatively, painless since they are easily removable. They have a weight limitation usually around 240 lbs. You need to make sure to check the local laws for requirements or restrictions. Most states limit the speed to 20 mph but don't require a license. It’s harder to change a tire since if the motor is in the rear wheel hub. The battery is one of the most expensive components on the bike. SLA (or sealed lead acid) batteries are the least expensive, but the heaviest, and have the least charge cycles. NiMH (nickel metal hydride) batteries are lightweight and fast charging but may be prone to memory loss. Li-ion (lithium ion) batteries are light, charge the fastest, and have the most charge cycles, and have little or no memory loss, but are also more expensive. Li-Po (lithium-Polymer) Are the newest, charge the fastest, are maintenance free, and can be shaped to suit the manufacturer. They are expensive but are likely the battery of the future for e-bikes. The battery should deliver at least 24 volts and can range up to 48 volts. Should be easily removable and accessible for charging. Most e-bikes are limited to 20 mph when under battery power only. But some electric bikes like the Stealth series can be adapted for speeds up to 5o mph. Speed is contingent on rider weight input, and terrain. The max range is usually 15 to 24 miles (40 to 50 on the Stealth) contingent on rider weight, input, and terrain. Twist grip throttle for speed control. Motor and battery should be sealed. Motors are DC and are built into the wheel hub. Return from electric bikes to home page.